Republic Day celebrations at Wagah border were held with pomp and show. Bollywood celebrities wished fans on social media. Dubai: Bollywood actors Vicky Kaushal, Yami Gautam and Varun Dhawan performed at the Attari-Wagah border, in Amritsar, Punjab, on the 70th Republic Day of India. Indians all over the world used #70thRepublicDay to celebrate the milestone occasion. Kaushal and Gautam were at the Wagah border in Amritsar and addressed the 28 thousand people who had come to attend the ceremony. The two actors recently starred in a war drama and received a loud welcome from fans. 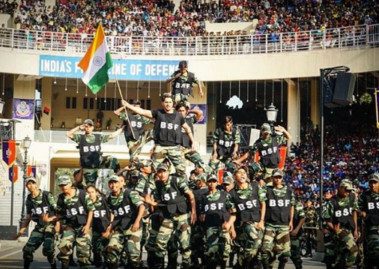 The actors wished the crowd on the occasion and raised slogans like “Jai Hind” (long live India) and asked everyone “How’s the josh?” (How is the excitement? ), a slogan from their movie Uri: The Surgical Strike. Kaushal uploaded a video of the celebrations on his official Instagram page and received more than 266 thousand views. Celebrities like Ranveer Singh, Dia Mirza and Raveena Tandon praised the duo. He later uploaded a picture of his dance performance and said it was an “honour” to perform at the Wagah border. Dhawan is in Punjab to film the third instalment of the ABCD (Any Body Can Dance) series, being directed by Remo D’Souza, who was also present for the Republic Day event. Other celebrities like Bollywood actors John Abraham, Kartik Aaryan, Sara Ali Khan and Karan Johar posted pictures of themselves in traditional attire and wished their fans on the occasion.